Pasupatinath temple is one of the most famous temples of Nepal.Its astonishing architectural beauty , stands as a symbol of faith, religion, culture and tradition.Regarded as the most sacred temple of Hindu Lord Shiva in the world, Pashupatinath Temple's existence dates back to 400 A.D.The temple is situated 5 kilometer east of Kathmandu heart, on the banks of sacred Bagmati River. Being one of the most important Hindu temples, this is a center of annual pilgrimage. The richly-ornamented pagoda houses the sacred linga or phallic symbol of Lord Shiva.The two level roofs are of copper with gold covering. It has four main doors, all covered with silver sheets. The western door has a statue of large bull or Nandi, again covered in gold. The struts under the roofs, dating from the late 17th century, are decorated with wood carvings of members of Shiva's family such as Parvati, Ganesh, Kumar or the Yoginis, as well as Hanuman, Rama, Sita, Lakshman and other gods and goddesses from the Ramayana.Pashaputi Temple's extensive grounds include many other old and important temples, shrines and statues. South of the temple is Chadeshvar, an inscribed Licchavi linga from the 7th century, and north of the temple is a 9th-century temple of Brahma. 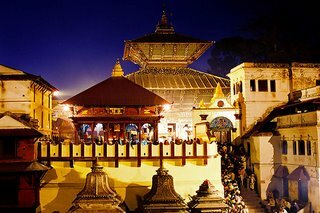 On the south side of Pashupati temple is the Dharmashila, a stone where sacred oaths are taken, and pillars with statues of various Shah kings.In the northeast corner of the temple courtyard is the small pagoda temple of Vasuki, the King of the Nagas. Vasuki has the form of a Naga (snake) from the waist upwards, while the lower parts are an intricate tangle of snakes' bodies. 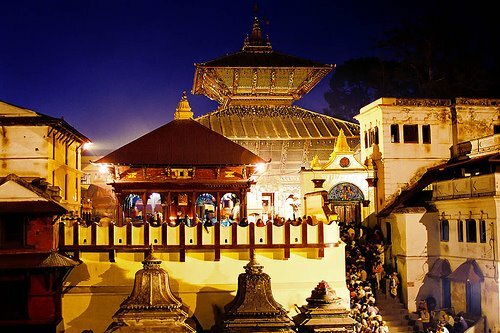 According to local belief, Vasuki took up residence here in order to protect Pashupati. One can often see devotees circumambulating and worshipping Vasuki before entering the main sanctum. Thousands of pilgrims from all over the world come to pay homage to this temple, that is also known as 'The Temple of Living Beings'.The Pasupatinath area has contained numerous temples, stupa, monasteries, images and inscriptions.The temple is listed in UNESCO World Cultural Heritage Site list. The Cow Legend: Legend says that Lord Shiva once took the form of an antelope and sported unkown in the forest on Bagmati river's east bank. The gods later caught up with him, and grabbing him by the horn, forced him to resume his divine form. The broken horn was worshipped as a linga but overtime it was buried and lost. Centuries later an astonished herdsmen found one of his cows showering the earth with milk. Digging deep at the site, he discovered the divine linga of Pashupatinath. The Linchchhavi Legend: According to Gopalraj Vamsavali, the oldest ever chronicle in Nepal, this temple was built by Supus Padeva, a Linchchhavi King, who according to the stone inscription erected by Jayadeva 11 in the courtyard of Pashupatinath in 753 AD, happened to be the ruler 39 generations before Manadeva (464-505 AD). The Devalaya Legend:Another chronicle states that Pashupatinath Temple was in the form of Linga shaped Devalaya before Supus Padeva constructed a five storey temple of Pashupatinath in this place. As the time passed, the need for reparing and renovating this temple arose. It is learnt that this temple was reconsturcted by a mediaeval King named Shivadeva (1099-1126 AD). It was renovated by Ananta Malla adding a roof to it.